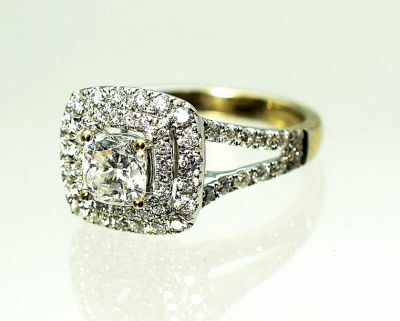 A stunning Art Deco style 18kt white and yellow gold split shank ring featuring 1 cushion brilliant cut diamond, est. 1.01ct (I1 clarity & E colour) and 64 round briiliant cut diamonds, est. 0.83ct (SI-I1 clarity & G-H-I colour) that are set in a double halo and in the split shank.